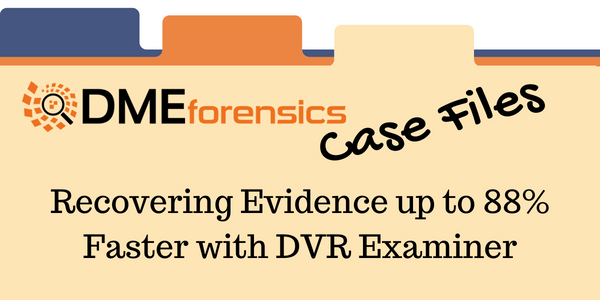 Case Files: Recovering Evidence Faster with DVR Examiner - DME Forensics Inc. This case study comes from Detective Raymond Coles from Ocean County. I was recently asked to assist my agency’s Special Victim’s Unit with a video extraction from a residential Digital Video Recorder. The case involved an infant who was discovered to have several broken bones, suspected to be from abuse by a caretaker. The residence had approximately eight cameras located inside the residence that had been set up to record on motion detection. However, the initial time of the incident was unknown, and the case officers had requested that I extract approximately five days of footage from all cameras in and around the residence. For someone not well-versed in utilizing a traditional video extraction method, that might not sound like a challenging task. From my experience, a typical DVR only likes to read FAT32 formatted USB drives and doesn’t like drives that exceed 32GB. The total size of the request once processed was approximately 800GB. In addition, since this camera was set up for motion activation, there were over 19,000 files within that five-day span. Utilizing the system’s proprietary method, I would have had to individually select each clip and load as close to the maximum size on the USB Flash Drive as possible. If I were to use best practices to preserve the content on unique flash drives, which would later be individually entered into evidence, it would have taken over 25 USB flash drives to store all of these files, which alone would cost approximately $350.00. Furthermore, I’d have to wait for each 32GB of files to process before I could load up the next batch of files onto the USB Flash Drive to process. On top of all that, the homeowner did not want to be without his residence’s DVR for more than one day. With DVR Examiner, I was able to connect the DVR’s hard drive to a validated USB 3.0 write blocker and connect it directly to a forensic workstation in my agency’s laboratory. I started the DVR Examiner process at approximately 8 p.m. and the entire requested footage was done processing before 8 a.m. the following morning. As an added bonus, DVR Examiner’s time offset feature was able to generate the file names in reference to the actual date and time to make it easier for the case officers to track and review, rather than having to manually add seventeen minutes per file. The generated report also gave a great documented report of every unique file to supplement my examination report. The last time I had a video request like this, before we had DVR Examiner, it took approximately one month to complete, and it was a nightmare to document. DVR Examiner saved me a great deal of pain and time and has been worth every penny in my opinion. While it’s hard to judge exactly how much time was saved by using DVR Examiner on this case, Ray estimated up to 88% of time savings as compared to traditional methods.